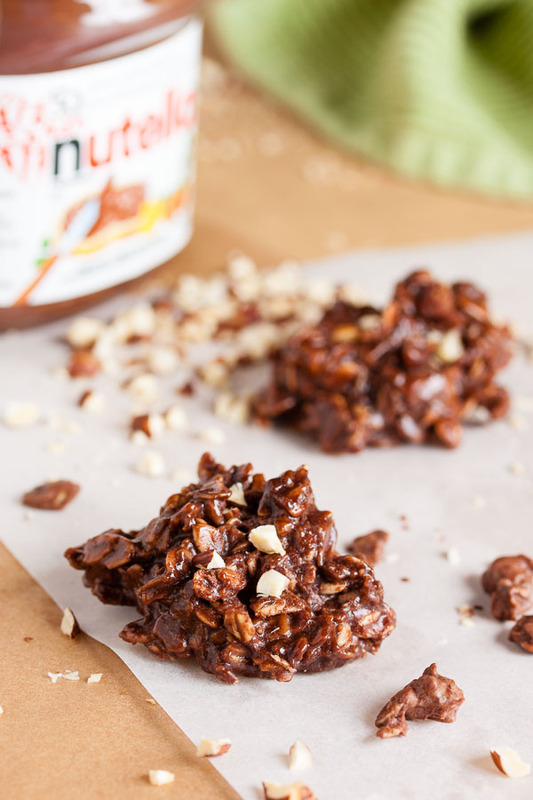 Nutella No-Bake Cookies | wanna come with? It’s unusually hot here in Vancouver. Seriously, we’re not used to this kind of weather here, especially not so early in the season (our summer weather usually hits in late-August/September). A week ago it was raining and I was wearing my heavy sweater, and suddenly my cats are sprawled out in front of the fan trying to keep cool and I’m wrapping myself in ice packs. It’s too hot. I’d like to go on record saying I do not like it this hot. Sorry, all you people who can’t get enough heat. And I know I’ve mentioned it before, but my kitchen is south-facing, so when it gets hot? There’s no way I’m turning on the oven. Which means? 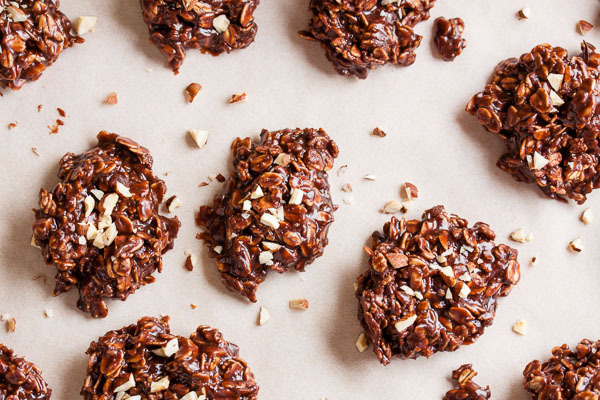 Time to delve into the no-bake cookie recipes! As if hating the hot weather weren’t enough, I’ve got another bombshell to drop on you all. I don’t like Nutella. I know! Whaaaat?? Who doesn’t love Nutella? Well, me apparently. I know it’s weird. I love chocolate, and I love nuts. But I find Nutella to be too sweet. I know I’m in the minority here, though, so I didn’t let my dislike deter me from making some Nutella no-bake cookies. 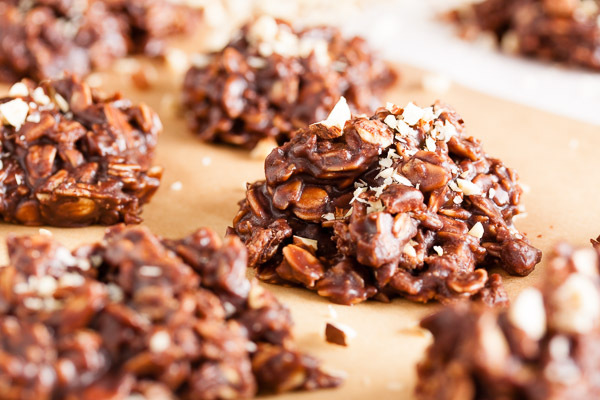 The first of this summer’s no-bakes. Last summer when I was making my no-bake cookies, I talked about how they were one of the few recipes my mom would make regularly. My mom? Not a big fan of baking. 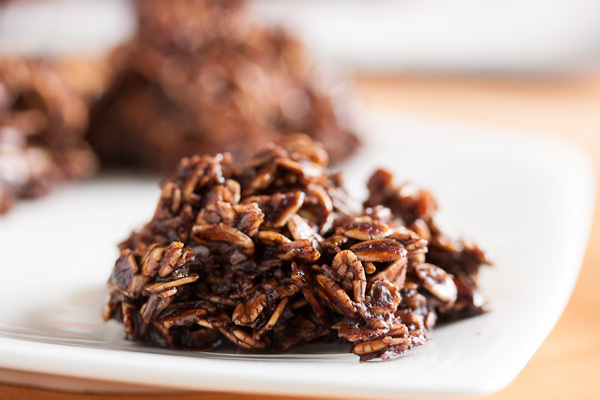 She had a few go-to standards when it came to no-bake cookies. I made a few of them last year, and there are one or two still to make (including my absolute favourite – I’m so excited!). 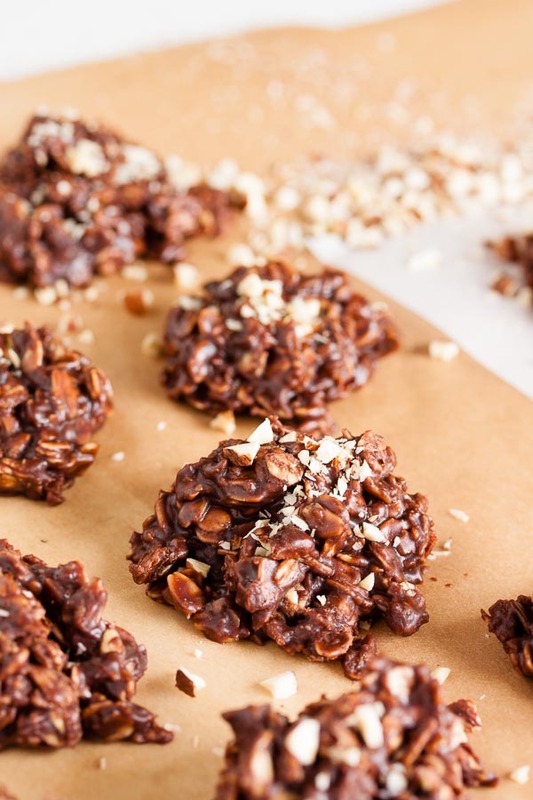 At that time, I was googling and trying to find some more variety in what’s possible with a no-bake cookie, but I kept finding variations on the same few recipes that I already had. Well, since then, I’ve kept an eye open and have been pinning a lot of different recipes to try. At this point, I don’t think I’ll be running out of no-bake cookie & bar recipes any time soon. Yay! Because I’m definitely needing them right about now. This is one of those recipes that I found online (not one of my mom’s). 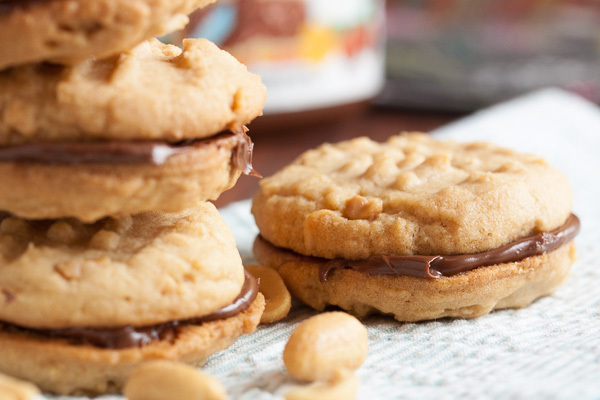 At heart, this cookie is very similar to the chocolate macaroons I made last year, except that these are made with Nutella and have chopped hazelnuts added to the mix. 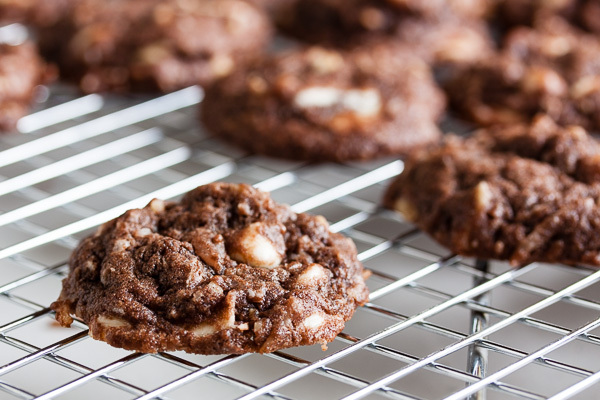 It’s a dense, fudgy cookie with a great texture and lots of chocolate and oat flavour. And it. Is. Popular. The cookie jar is emptying in record time. Personally? I find it a little too sweet. I can easily pass on this one. But my coworkers are absolutely loving them. Adapted from Foodie Crush. Go check out her site – seriously beautiful stuff! She states this recipe will yield about 24-30 cookies, but I got 40. It depends how big you make them. Combine the butter, milk, sugar and cocoa powder in a saucepan and melt ingredients together over medium heat, stirring occasionally. Bring to a boil. Once a rolling boil has been reached, continue to cook for about a minute, stirring often. Add the nutella, vanilla, and salt, and stir well until the mixture is smooth. 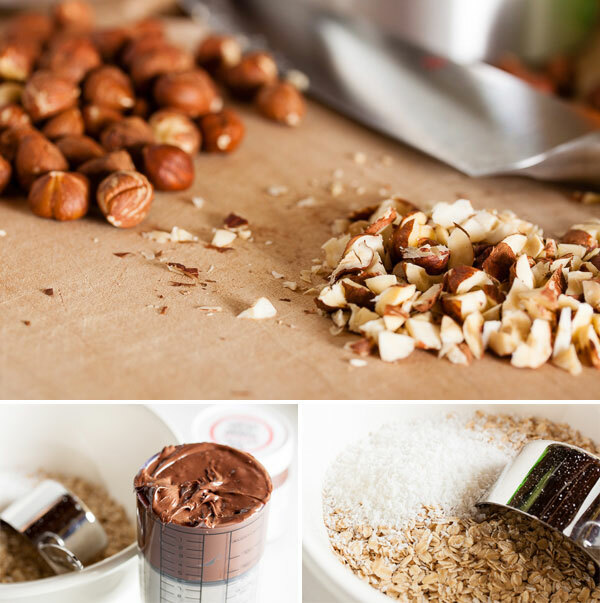 Remove from heat and add the rolled oats, hazelnuts, and coconut, and stir until completely moistened. Using a tablespoon, portion out onto sheets of wax paper or parchment paper and sprinkle the tops with the set-aside chopped hazelnuts. Allow to set.